Much of my work involves human psychophysics: volunteers doing vision experiments. Often people come into my lab at Newcastle University; occasionally we go out into the community to test people at locations like the Centre for Life or Great North Museum. The experiments are usually aimed at testing particular theories about how the brain computes what we see. I always say my psychophysics experiments are like a cross between a trip to the optician’s and a particularly boring computer game. They typically involve sitting in a dimly-light room staring at a computer screen and pressing a mouse to indicate judgments about what you see: did that pattern move left or right? Was that patch of dots in front of or behind the other patch of dots? Sometimes we’re just interested in how the healthy brain typically works; sometimes we are trying to examine how vision may be different in people with a particular health condition, e.g. strabismus, and so need to compare them with “control” people who do not have that health condition. At the time people come and take part in the experiments, I’m not in a position to tell them what we learnt. As you can see by comparing the study dates given below with the dates of the associated publications, it can often take months or even years to complete a study — that includes collecting all the data, including running all the new experiments we hadn’t initially thought of but which our first few experiments indicated we needed, analysing the data, writing the paper and then going through the long process of submission, review, resubmission and, hopefully, eventually publication. So, I’ve written this section of the lab website to update people on the outcomes of various studies. PDFs of all the papers mentioned are available to download below, as well as on my publications page. If you helped us with one of the studies detailed below, a big THANK YOU! and I hope you find it interesting to see how your input has helped advance science. If you would like to volunteer for neuroscience experiments in mine or others’ labs in the future, please consider becoming a member of our Research Volunteer Database. If you have any questions about research in my lab, or any feedback on your experience as a volunteer, do drop me a line or leave me a comment here on my website. We are very grateful to our volunteers and want to make it a good experience for you. We ran this study in Newcastle’s Centre for Life science centre, while our collaborator Dr Ignacio Serrano Pedraza ran a similar study in Madrid. The data were collected by students Will Herbert and Michael Widdall. We were interested in a particular aspect of human 3D vision. Most people are more sensitive to small depth corrugations if these are oriented horizontally – like looking at a set of Venetian blinds – than if they are oriented vertically, like the hanging folds of a curtain. We assume this is because detecting horizontal depth corrugations are somehow more important in everyday life (maybe because they could reflect unevenness on the ground?). If so, then maybe children might take time to develop this aspect of stereo vision. To test this, we asked children and adults of many different ages to tell us which corrugations they could and couldn’t perceive. We found that young children were on average as good at detecting 3D vertical corrugations as at horizontal. In fact, on average they were better than the grown-ups at detecting vertical corrugations. This was surprising, since in general children’s 3D vision doesn’t work quite as well as adults’: it continues to improve until the age of 10 or so (and doesn’t usually start to get worse until the age of 50 or so!). 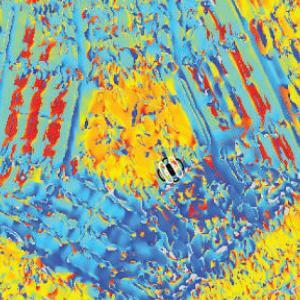 This tells us that the development of stereo 3D vision isn’t simply a process of gradual improvement; as we grow up, our stereo vision is being shaped by the environment and refined so as to be most useful to us — and this can mean no improvement or even some decline in specific aspects of vision. In 2011, my lab ran a major study of TV viewing in Newcastle, funded by the broadcaster BSkyB. 30 local households were recruited to the study and were given a new TV. Everyday for 8 weeks, they filled in an online questionnaire about their viewing experiences. They also came to my lab both before and after the 8 weeks. During this visit, they viewed a film and carry out some tests. Additionally, >300 local people came to my lab to view the film and carry out the tests without having a new TV at home. In this study, we were actually comparing viewer experience in 3D TV as compared with traditional 2D TV. We deliberately didn’t spell this out at the time, as we didn’t want to tell people watching 2D that they were our control group, in case this changed their answers. This was approved by our ethics committee. If you were one of the volunteers in this study, thank you very much! This was one of my most popular experiments — people generally seemed to enjoy it; I hope you did too. I’ve written an article about this study and our findings on The Conversation website. Please feel free to ask me more about it in the comments. The data in this study were collected by two sixth-formers as part of a Nuffield Summer Science project in my lab. We were interested in how much harder it is to do a demanding manual task with only one eye. 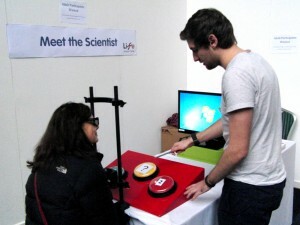 Dozens of adults and children at the Centre for Life and other Newcastle venues joined in these experiments. We concluded that binocular vision is particularly important on tasks where you handle objects with tools, e.g. 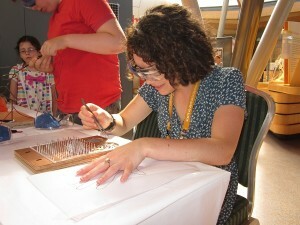 tweezers, rather than directly with your finger-tips. This project was piloted by a local sixth-former on the Nuffield scheme, and the final data were collected by two undergraduates as part of their third-year project. We showed that most people find the scintillating grid illusion, a well-known visual illusion, more powerful when it is presented to both eyes, not just one. 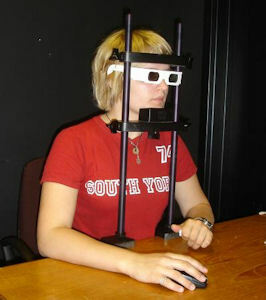 We used a 3D computer monitor so people had both eyes open throughout the experiment, and didn’t know that they were seeing the image sometimes in the left eye, sometimes the right and sometimes both. In intermittent exotropia, one eye occasionally turns outwards, often when the person is tired. Interestingly, people with this condition tend not to report double vision when their eye drifts out of alignment, even though they do have good vision in both eyes. We were interested in how they avoid this. We recruited patients attending a local eye clinic. They were mainly children, so thanks very much both to our children patients and to their parents for bringing them along. We also needed children without eye problems for comparison, so thanks very much for these too. In this study, we used children as young as 4, so we worked hard to make the psychophysical experiment as engaging as possible for the children. We had big colourful buttons for them to thump, and a child’s voice giving them encouragement as they answered. We learnt that suppression in intermittent exotropia is triggered by the retinal image, not the eye position. Even when their eyes are correctly aligned, children with intermittent exotropia suppress images which occur at very different positions in the two eyes, so they do not experience double vision even when people without exotropia do. However this only applies when the images are in positions which could be due to exotropia. This was one of many studies in the literature looking at patient DF, a woman who has damage to a particular part of her brain resulting in an inability to recognise objects by sight. In many ways she’s effectively blind, but in other ways she can see very well, e.g. when navigating around obstacles by sight. Luckily for science, DF is interested in neuroscience and visual perception, and has taken part in many experiments designed to understand exactly what she can and cannot see. In this way, scientists hope to gain insight into what the damaged part of her brain does when it is undamaged. For this study, we needed several control subjects of similar ages to DF, so we could be sure the differences were due to her brain injury. Of course, ideally we would have had several patients with the same brain injury, but that’s not possible, as her condition is extremely rare. Such “n=1” studies are a hazard in neuropsychology! DF’s stereo vision had previously been reported as present but impaired. However, in this study, we learnt that DF’s stereo vision is actually good as controls’ in some situations, for example judging the distance of an isolated object, which is something most people find hard. She has particular difficulty in comparing the depth of adjacent objects, something people are typically very good at.